This hack is complete, but there are still a couple of bugs present that will be fixed in due time. None of the bugs interefere with the player's ability to enjoy the hack. Temporus is a 7-room mini hack. Don't let the small number of rooms fool you; most of my beta testers still took about an hour or more to reach the end. This hack is difficult, but NOT because of a requirement for advanced tricks. You won't need to know how to do things like mockball or short-charge. 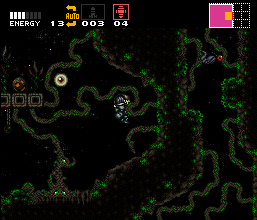 Nevertheless, this hack still isn't reccomended if you're not well familiar with how Super Metroid is played. The difficulty comes simply from the puzzle and enemy elements. You'll need to tread carefully and explore every nook and cranny to find your way to the end. You'll know when you reach it - don't forget to return to the ship! 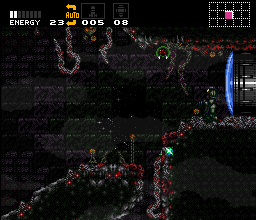 - When entering heated rooms, Samus' palette briefly switches back to Gravity. Jumping (or most other types of movement) fixes it right away. - Spinjump restarting produces an infinte sound if activated on the exact frame that Samus lands on the ground. Firing a beam stops the sound. Not likely to happen by accident, but still a possibility. - The map isn't one large map, but several smaller ones (multiple areas). Not necessarily a bug, but something I'll have to fix eventually. - After Kraid is dead and Samus passes through his room again, there is a tiny graphical error. This is caused by the use of Rakki's door speed-up patch. More specifically, it seems to only happen when using Snes9X and not ZSNES. This only happens ONCE, and the buggy graphics vanish whenever they're panned off-screen by jumping or leaving the room. Only happens in his room.